In the bustling city of Ho Chi Minh lie a sea of products in their local supermarket. 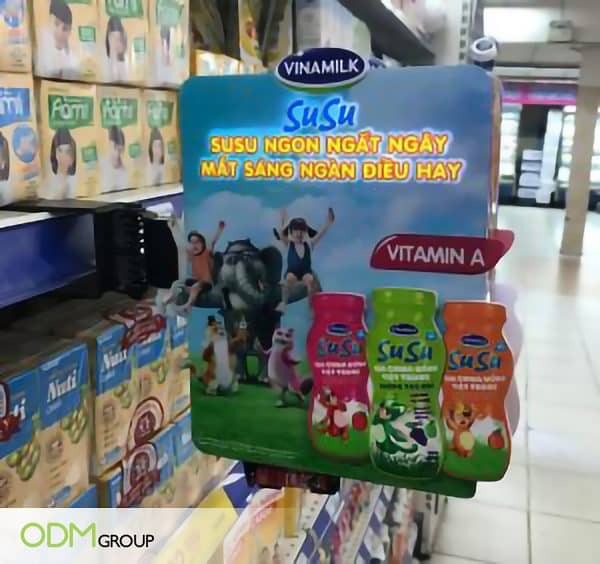 Above all, capturing the attention of shoppers despite the wide selection is Vinamilk with its innovative in-store display that reminds locals to get their daily intake of calcium. Furthermore, the brightly lit word and bottles swaying from left to right showcase its marketing potential to increase brand awareness. What Are The Benefits of an Innovative In-Store Display? Visibility – The custom 3D sign with shining lights and image movements help to differentiate the brand among the others. Hence, it gives a sense of affirmation and credibility as the eyes made first contact with it. Cost-Saving – These displays are small and cheap to produce for direct advertising to locals in Vietnam as compared to digital marketing on televisions and internet. Therefore, Vinamilk set itself as a strong competitor as it is able to effectively minimize costs while promoting the brand desirably. Colors – Colors have a strong psychological effect on consumers’ buying behavior and decisions. Also, it is certainly able to appeal to our visual senses, stimulating excitement or tranquility according to various color schemes. Hence, Vinamilk took advantage of a cooler color scheme (blue and green) that builds a more dependent and trusting relationship with customers. Overall, an custom In-Store display is crucial to businesses sales and marketing strategy. Likewise, with a creative idea, it will certainly to grab hold of consumers’ attention and entice customers to spend. If you are looking for fresh ideas to raise sales, feel free to contact ODM as the team has great experience in this field to help. You can count on us for effective and beautiful POS display units and custom POP display for in-store advertising projects.